To Make Pineapple Filling: Mix 1 cup crushed pineapple and juice (8 1/4-ounce can), 1 cup sugar, 2 1/2 Tablespoons cornstarch, 1 Tablespoon butter, and 1 cup water in saucepan. Cook until thickened, cool. Cream together shortening and sugar thoroughly. Stir in flour, baking soda and salt. Mix in rolled oats. Press and flatten half of the mixture over bottom of a 13 x 9 1/2 x 2 inch greased pan. Spread with cooled filling. Top with remaining crumb mixture, patting lightly. Bake 25 to 30 minutes, or until lightly browned. While warm cut into bars and remove from pan. Pretty good. I'd recommend using pineapple juice or some kind of citrus juice instead of 1 cup of water. I also added cinnamon and used margarine instead of shortening. very good, family loved it. cooked pineapple filling to low boil for 1 min. and used butter flavored shortening. Excellent! 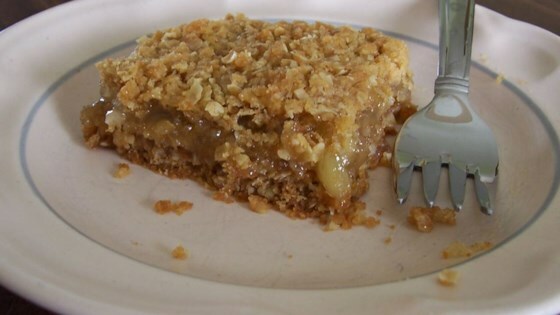 I used fresh pineapple and add 1 tp of cinnamon to crumb topping and 1/2 tp of vanilla to filling. Thanks for the recipe. This is a wonderful, easy recipe.